I would guess many people would run into this situation at some point. A developer or DBA creates a database, then decides to rename it, but the logical and physical names aren’t correct. This post will look at how to do this. A couple of notes and then the process below. 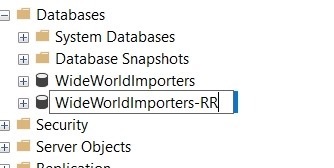 This might not matter to many of you, but in development, I sometimes find I’ll rename a database and then attempt to recreate (or deploy) a new database with the old name. The mdf/ldf files don’t match, and I realize it’s because I’m using defaults. However, I’d also say this is an issue in a DR situation. If the filenames don’t seem to match, someone might restore the wrong database or the wrong files. Or worse, think the can delete a file on the file system because there’s no database with that name. This is easy. Right click, select Rename. Then type the name name. 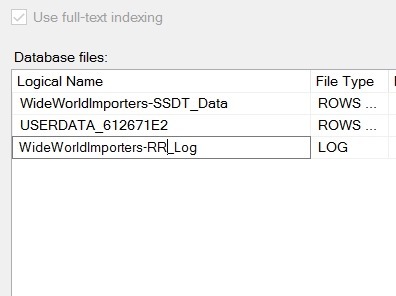 In this case, I’m going from WideWorldImporters-SSDT to WideWorldImporters-RR. Not really what I want. 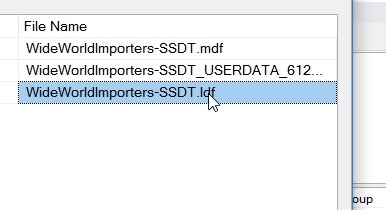 I need these mdf/ldf files to be changed. How do I do this? 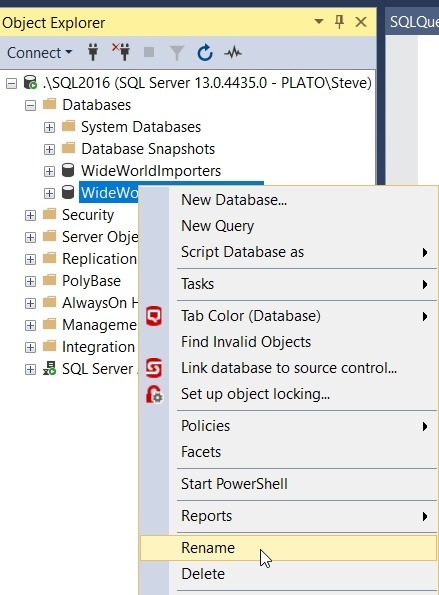 I can get to the properties for the database and select the “Files” pane to get a list of files. Here I can change the logical name by clicking that field and typing a new name. I’ve done that here. However, if I scroll to the right to the File Name column, I can’t change anything. What I need to do is use the ALTER DATABASE command with the MODIFY FILE command. I need to do this twice. Let’s do that. Here’s the code to change the physical name. I need to repeat this for the log file and the MOT file. Once I change the names, I get this message. This is key. If I were to restart my system now, when the database attempted to start and go through recovery, the files would not have been found. Now, I need to change the physical file names. To do that, I first need to take the database offline. Then I go to the location of the physical files and rename them in Windows Explorer. Now I bring the database online. Once that’s done, I can then use ALTER DATABASE again to change the logical file names. And run a final sp_helpdb. An easy task, with a touch of research in Books Online, but not too difficult. This took me about 10 minutes to do, and since I realized this was a good skill, I took screenshots and saved code as I went. Then about 10 minutes to write this up. This entry was posted in Blog and tagged administration, sql server, SQLNewBlogger, syndicated. Bookmark the permalink.